Rebecca Gordon-Nesbitt was selected by party members in April but the NEC did not endorse the former art curator saying she had brought the party into disrepute based on tweets made from a Centre for Cultural Change Twitter account. Accusations were made by ‘political’ blog Guido Fawkes that tweets from the account, used by Dr Gordon-Nesbitt as well as other academics, questioned the “Zionist sympathies” of Jewish MPs and defended suspended member Jackie Walker. Dr Gordon-Nesbitt says she occasionally contributed to the account, which was closed after the accusations last year, but had endorsements to say neither she or the tweets were antisemitic. In an email to party members Dr Gordon-Nesbitt says: “Despite all of these endorsements and the fact that I had notified the party and worked with staff to issue a public apology as soon as the tweets first came to light, the NEC decided not to endorse me on the basis that I’d brought the party into disrepute. Dr Gordon-Nesbitt claims the leak to Guido Fawkes, which first highlighted her link to the twitter account, initially came from within her own party. She says the tweets were also taken out of context. Dr Gordon-Nesbitt, who said she has been the target of attacks from Tories, the National Front and members of her own party, will spend the Christmas period considering her options. The selection process for a parliamentary candidate must now begin again. Just proves the left is more right than the right. You know i am right ! Right? Congratulations to the Guido Fawkes news site for their excellently well researched exposé on Gordon-Nesbitt’s treatment of Jewish MPs and defence of the repellent Jackie Walker. Characters holding such views should have no place in a modern political party in this country, be they the leader of the Labour Party, the Shadow Chancellor, or anyone else. Thank you to the NEC for grasping this nettle and let us hope the next Prospective Parliamentary Candidate for Labour in South Thanet holds moderate views that decent folk can understand and support, even if they are unwilling to trust the Labour Party with the economy ever again. Jim Bob From Broadstairs. ‘treatment of Jewish MPs?’ – she has not been accused of anything related to any other MPs. The accusation relates entirely to three tweets. The tweets question the antisemitism row itself. That is the entirety of the claim against her. The “anti-semitism” smear campaign has claimed another victim. If you dig for long enough in any Twitter account, especially if shared with others, you are bound to find something that someone once said way back that wasn’t disapproved of by someone else when they should have done. So THEY must be wrong as well. It has reached such a peak in the Labour Party that some of the members expelled for this have been of Jewish origin themselves. But, rather than stand up to this campaign , leading bodies in the Party just expel or discipline the members involved in the hope that the problem will go away. It won’t. The Right Wing establishment , including the newspapers , this “Guido Fawkes” character and his blog, and the Tory Party, are onto a winner with these accusations of anti-semitism. So they won’t stop. They will just keep on digging and blogging and smearing until they get their way. Which is another Tory government committed to more poverty for the people and more cash for the rich. And this time they will, reasonably, blame “ongoing, temporary problems with Brexit adjustments” instead of the current excuse which is all about the Wall Street crash of 2008 which they say the UK Labour Party caused!! She claims to campaign for a better NHS in Thanet ? But dodged issues of Labour cllrs for years breaching statutory duty to promote public health well being. Which means she dodged Thanet huge problem of environmental hazards to health. Westwood toxic waste. Pegwell toxic waste. Thor and Sericol contamination remediations. Manston and especially its fireschool and need for tests for toxic residue of firefighting foams over aquifer. I don’t know if this is included in tests Environment Agency have now scheduled for Manston but I have let national planning know. I suspect lots of people are unaware of this, I’ve certainly never heard anyone raise this in recent years. I don’t think you can say she’s ‘dodging’ something that is well off the political radar, especially when there are some massive and very serious imminent NHS issues in Thanet right now. I’ve been talking to people all over Thanet about A&E, the stroke unit and our diminishing GP surgeries, and no-one has ever mentioned this matter. If this is a matter for serious concern, why don’t you get Kathy to do a piece on it? Richard has been blogging and posting about these issues for several years now. He regularly updates his research and has raised many environmental concerns via a number of outlets. Back in the days of Thanet Strife he was a regular contributor. China Gateway.Project anyone? Aquifer contamination anyone? Seem to recall, Richard, you were active then, too. Who remembers the Tesco bag of papers found in a hedge? Labour’s recent surge in popularity has clearly got the Tories rattled. 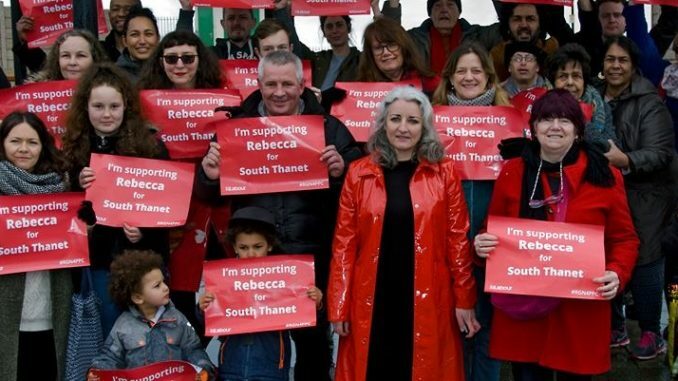 These problems of pollution and environmental damage in Thanet sound worrying but why pick on Rebecca Gordon-Nesbitt who is only the Labour candidate for a seat held by a Tory MP, Craig Mackindlay? Rebecca GN has no power to make changes until elected so these issues are beyond her control. Mackindlay is the one with the influence in Parliament as he is a Tory MP with a Tory government in charge. Of course, the Government may have been a bit distracted lately, what with trying to stay together to create the least-worst version of Brexit possible. No more worries about pollution and environmental rules after Brexit. The regulations will just be abolished as they are just “red-tape stifling business enterprise”. After that we can all stifle on the chemicals but , at least, business won’t be bothered with regulations. On Saturday I will be having a Christmas drink with a close friend who is Jewish, and although we may disagree politically on many issues, he is as anti-Zionist as I am! I know one or two other Jewish people, not well, but who share my view that many right wing Jewish people try and smear anyone who dares to criticise Israel, and thats the point here! Its a deliberate ploy to muddy the waters, and confuse people into believing anti-Zionism is anti-semitism they are two totally different things. Ken Livingstone a dedicated socialist democrat, was forced to resign from the Labour party, which he had served all his life, because he dared say Hitler was a Zionist! He was, if anyone wants to take the trouble to read page 150 of Eric Hobsbaum’s book Age of Extremes, the eminent Jewish historian, says clearly “NAZI policy, however barbarous the treatment of the Jews, still appeared to envisage the final solution of the ‘Jewish problem’ as mass expulsion rather than mass extermination”. This was probably to Palestine had they won the war! So why was Ken Livingston expelled from the Labour party? Its a scandal there are a miniscule minority in the Labour party, who are allowed to get away with these types of witch hunts! Hmmm . . . if we now adopt the policy that no prospective parliamentary candidate (for any party) is ever allowed to have made some historical comment against any individual, country, group, organisation, faction, religion, ethnicity, sexual preference, belief, viewpoint, etc., etc., – we could end up being very short of MPs . . .
Don’t worry, Labour will parachute another candidate in to Thanet, who knows nothing about Thanet and it’s many problems, just another stepping stone on their political careers. when will Labour learn and put forward someone who has actually lived here for some time. I’m not sure what Planet the “Planet Thanet resident” lives on, but it can’t be near here. The last two Labour candidates in the South Thanet constituency were Will Scobie (Thanet born and bred) and Raushan Ara (long term Ramsgate resident, Ramsgate business owner and well known community activist.) By contrast, recent Tory/UKIP candidates have included Craig Mackindlay from West Kent, Nigel Farage with a house in West Kent and another in central London, and (not the worst) Laura Sandys who had previously lived in London and Washington, USA, and was selected for South Thanet after trying for 13 other constituencies around the country. So I don’t think that Labour has a poor record in this respect.